“This is for my daughter,” said Jason Perez as he suddenly started stabbing a 19-year-old who was walking his 5-year-old Pit Bull, Droogie, in West Covina, Calif., Saturday afternoon. It was apparently a case of mistaken identity. The unidentified victim, who was taking a walk with Droogie, his mom and a smaller dog named Pebbles, first encountered Perez a few minutes before the attack. Perez complimented Droogie at the time. A few minutes later, Perez approached the teen again and asked if his name was Christian, which it is not. The third time Perez approached the teen, he pulled out a screwdriver and started his unprovoked attack. “I was backpedaling. I ended up tripping,” the victim told the San Gabriel Valley Tribune. His mother tried to block some of Perez’s swings, and then Droogie came to his rescue by pouncing on the attacker. The victim grabbed Droogie’s leash and ran, as Perez continued chasing him. Fortunately the victim’s brother happened to drive by, and drove his family to safety. Police responding to 911 calls took Perez into custody, charging him with attempted murder and assault with a deadly weapon. Perez was hospitalized and treated for bites to his buttocks, torso, arms and legs, West Covina Police Lt. Dennis Patton told the Tribune. The victim was treated for non-life-threatening puncture wounds on his upper body. “I’m feeling fine today,” he told the Tribune the day after the attack. Droogie, who had previously never shown aggression, suffered a minor stab wound to his neck, but is otherwise doing fine. 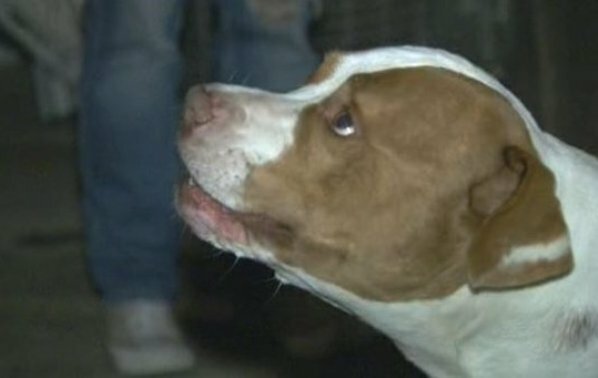 The victim said his hero dog is getting plenty of rewards for saving him. “We gave him leftover food last night, sausages this morning and a lot of treats in between,” he told the Tribune.